Loch Katrine lies at the very heart of the Trossachs and has been famed for generations for its wild and unspoiled setting. The new Loch Katrine Lodges right on the shore offer a different perspective on this loch and its associations with Rob Roy and Sir Walter Scott. Loch Katrine owes at least some of its fame and popularity to the fact that it is in the heart of the Trossachs - where tourism began more than two centuries ago. Maybe it isn’t quite as well known by name as Loch Ness or Loch Lomond, which are at the top of the list, but the beauties of Loch Katrine have been enjoyed for a very long time. Sir Walter Scott (unionist toadie or champion of fantasy Scotland, depending on viewpoint) really put it on the map, though it had been already discovered by the first tourists, even before the end of the 18th century. Scott focused attention on the loch in 1810 with his verse-narrative blockbuster The Lady of the Lake, which used local settings to tell a fantastical romantic tale. A close parallel today is, of course, the runaway success of the Outlander series of novels, which likewise have brought many visitors to hunt for their own romantic vision of Scotland. Loch Katrine - heart of the Trossachs? In a sense, Loch Katrine is synonymous with the Trossachs. Elsewhere on this site we allude to the fact that nobody can quite agree on how far the area we call The Trossachs stretches, but most agree where the centre is: the short winding road that leads west to Loch Katrine. And what lies at the very centre? A great big car park that gives access to the Trossachs pier at the east end of Loch Katrine. Tour buses, camper-vans, cyclists, walkers, as well as plenty of private vehicles...inevitably they all end up at the Trossachs car park! 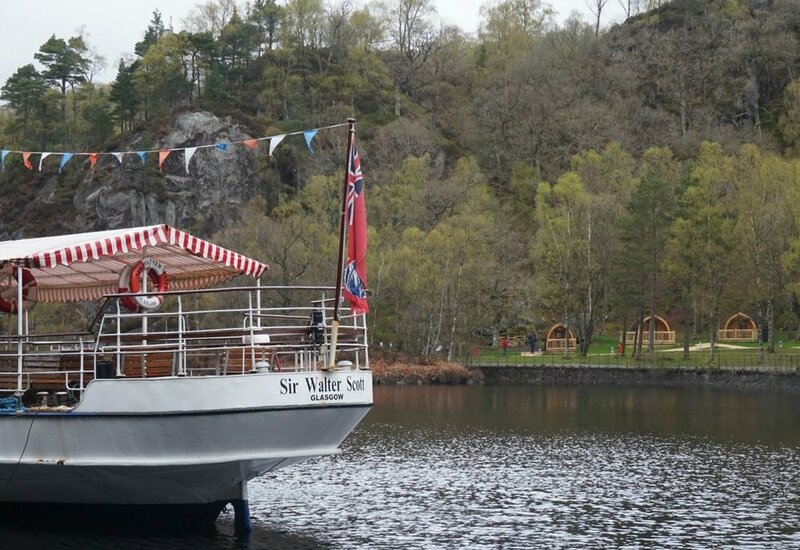 The Trossachs Pier and today’s SS Sir Walter Scott, ready for cruising. Launched in 1900, it ran on coal till conversion to bio-fuel for the 2008 season, as part of a major re-fit. Best of all, you are welcome to walk or cycle on it - and it’s all very pleasant in consequence. Keep it simple, eh? Motorable roads have big arrows, so you can see where Loch Katrine lies in relation to Callander and Aberfoyle. Key to this though is the dotted line along the north shore. That's the lovely surfaced road that is not plagued by cars, tour buses, motor cyclists etc. Nope, you can walk or cycle on it. And, apart from the cars of a few locals, that's it. Brilliant. Note key position of Loch Katrine Lodges. 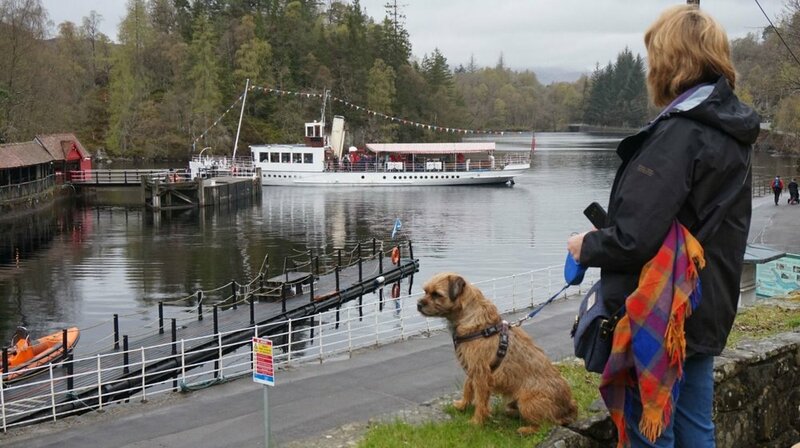 OK, so here are some ingredients for a day out by Loch Katrine: arrive at car park, grab a coffee or more at the friendly cafe (oh, wait, unless you have a dog), take a cruise on the boat and take a walk. Mix and rearrange options to suit. Or you can hire bikes right there in the car park. Listen up, there’s even more. You could take the bike (your own or hired) with you on the boat, then get off near the western end of the loch, at Stronachlachar. There’s a tearoom at Stronachlachar. Note this if you are intending to cycle back by the aforementioned traffic-free road. The SS Sir Walter Scott sorting itself out before heading up the loch between the islands. Trossachs Pier left, Loch Katrine road disappearing off to the right and re-appearing distantly...it goes on for miles and miles! Robbie the Border Terrier probably staring at another dog in the car-park, out of picture left. View is from the outdoor terrace of the Steamship Cafe. Loch Katrine Lodges just round the corner, right. - and why it's soapy in Glasgow. Right, there’s one more thing that makes Loch Katrine an attractive setting. It’s Glasgow’s water supply and has been ever since old Queen Vicky opened the works. She sailed up the loch to Royal Cottage (on the south shore, walkable from Stronachlachar). Now, I could tell you lots more about Glasgow’s water. It tastes very nice for a start. And when the folk of Glasgow got running water from Loch Katrine in 1859 the gee-whizz fact that’s been repeated ever since is that soap consumption in the city fell by half. Presumably, the water was so pure and soft that the soap produced twice the lather...oh, stop, stop. The point here is that for at least a century and a half, the catchment area around the loch has been kept pristine. Very little settlement, certainly no industry, no agricultural run-off - virtually no development at all. In turn, other than a few houses for the water engineers and other staff, plus some scattered houses in private ownership, accommodation for visitors right at Loch Katrine has been pretty much non-existent. Until now. See? I told you the lodges were handy for the SS Sir Walter Scott. Opened in 2018, Loch Katrine Eco Lodges are eco friendly, comfortable and ideal if you really want to get to know the Loch Katrine area. ‘Lodges’, in truth, as a description only take in part of what is now on offer there if you are looking for Loch Katrine accommodation. There are electrical hookups for campervans, motorhomes, winnebegoes or whatever you call these big things that hold you up because they drive so slowly. There is some camping space and the lodges come in at least two specs to suit you budget. And here’s the best bit. If you get the right lodge you can actually sit up in bed with a cup of tea and see the SS Sir Walter Scott and the summit of Ben Venue at the same time! Impressed? I was. I mean how often do I get tea in bed? We stayed in "Loch Achray" - very comfortable indeed. De-luxe lodge interior. We pretty soon mussed it up. Bed was a king-size. Dog-lead included for sense of scale. NB Remember to take your boots off outside. Besides, after the crowds have gone, in the evening a stillness falls on the loch and you get the loch-side road practically all to yourself. Sometimes you hear the word ‘pod’ being used about them. Maybe this is a reference to the fact that they are quite compact - though the en suite ones have a positively spacious shower, for example. But it’s all very comfortable and well furnished. So, in summary, if you want a different perspective of this birthplace of Scottish tourism, then the Loch Katrine Eco Lodge experience comes recommended. This is by way of disclosure - we were invited to ‘test-drive’ the new lodges and give some practical feedback on the experience. This we have done (and, no, we’re not telling you). But we would be happy to go back any time. One final point: the whole accommodation operation is to provide funds to keep the historic vessel SS Sir Walter Scott running for years to come - so your visit contributes to a good cause. More about the new accommodation on Loch Katrine in our blog.